My friend Tamara has three awesome daughters. I’ve never met them in person, but I’ve loved them from afar whenever I hear stories about them from Tamara. These three wonderful teens —Cassidy, McKenna + Cori — got wind of my Love List idea last year and they decided to make a video for their dad, Steve. The first time I watched this video, I was in tears the whole time. It was simply so moving to witness the love these girls have for their Dad and the creative way they expressed it. 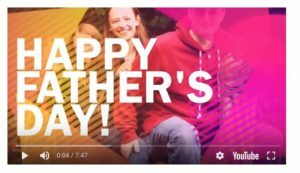 You might choose to watch this video to get inspiration for a Dad’s day gift for your own father or for your children’s dad. Or, you might watch it just because you want to feel that warm tug at your heartstrings. No matter why you watch it, I hope you’ll be sure to notice how infectious love is. We don’t have to know this family in order to be uplifted by their love. When people put love into action, the ripples are felt for many miles and many moons. For those of you who may want to try a Love List video yourself — for Father’s Day, birthdays, graduation or other occasions, below are some things I learned from Cassidy, McKenna + Cori. Include just a few heartwarming or fun photos at the start of your video to set the mood. Set your video to upbeat music that the recipient will love. Don’t wait. The idea is here in front of you at this moment. Think of someone whom you want to pay tribute to and say it now! If you make a video — or your children make a video— I hope you’ll tell us about it in the Facebook comments or via email to me!